With the spotlight shining on ergonomics issues lately, the modern workplace has been labelled as "dangerous" by the press. Today's office workers - manning the new frontier in wired skyscrapers and small businesses - are learning the hard way about work-related health disorders, including chronic back pain, neck pain and shoulder tension. An office worker can spend anything from 25 to 40 hours a week in a static position working at a computer. Travelling to and from work may involve long journeys either sitting (or more likely standing) on a train or bus with no room for movement. When we get home, it is far easier to sit and eat dinner in front of the TV, spending the rest of the evening sprawled on the sofa, than it is to go out and get some exercise. Back pain is one of the most common work related health problems - yet it can be easily prevented by ensuring that your working environment is back friendly. In the United Kingdom the charity BackCare estimate that back pain and related illness cost industry $10 billion annually through absenteeism. The modern workplace is full of new ergonomic dangers and pitfalls that call for pioneering safety measures. Just as the new technology of the information place is a source of these dangers, it is also part of the cure. Telephone headsets, such as the ones manufactured by Plantronics, Inc., are a prime example of a safety enhancement accessory that should be incorporated into the modern office environment. Once worn only by telephone operators back in the 1950s, headsets are finding their way into offices across the world, and with good reason. Headsets are known to add many advantages to the workplace. According to a Santa Clara Valley Medical Study, headsets reduce neck pain, upper back pain, and shoulder tension by as much as 41 percent. An additional study by H.B. Maynard & Co., Inc. concluded that adding hands-free headsets to office telephones improved productivity by up to 43 percent. Headsets are also known to reduce the chances of work-related physical disorders, specifically injuries of the neck and upper body, resulting in reduced workers' compensation costs. "Unlike manual worker safety, the issue of occupational injury among office staff is still not taken seriously enough by employers", said Elizabeth Simpson MCSP, SRP at the European Institute of Health and Medical Sciences. "This is partly because the injuries caused by bad telephone habits cannot be seen and take time to manifest. Research has shown that the use of telephone headsets can reduce neck pain, back pain and headaches in subjects who use the phone and computer simultaneously for a minimum of two hours a day." It is in the use of the telephone handset that the most significant work related disorders of the neck could occur. When the seemingly simple act of squeezing the handset against the shoulder and neck is performed routinely, or held for long periods of time, anything ranging from discomfort to structural tissue damage can occur. 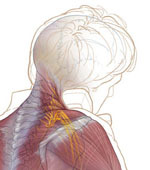 Chronic neck pain, and/or back pain, is often the result. The use of telephone headsets is beneficial for improving head and neck postures. With the freedom a headset provides, awkward and prolonged static postures of the head, neck and shoulders can be avoided. In an even greater sense, the freedom offered by hands-free movement allows workers extra mobility, reducing static loads on the entire body, and potentially contributing to greater worker comfort and productivity and reducing the risk of back pain or neck pain Headsets also are known to alleviate stress on the neck for all-day users, as well as for those who use the telephone sporadically throughout the day. Upper body disorders, medically referred to as "musculoskeletal disorders," represent a variety of problems involving repetitive stress injuries of the tendons muscles, nerves and supporting structures. They can range in severity from occasional to frequent, or from annoying to debilitating. The disorders of the upper body and extremities have been studied for many years. Most often, such studies have focused on the arms, hands, wrists, shoulders and elbows. Literally volumes have been written regarding the specific disorders associated with these body parts, i.e. carpal tunnel syndrome in the wrists epicondylitis in the elbows, DeQuervains disease in the hands, just to name a few. Fewer, but not less important, studies have addressed the symptoms associated with the neck experienced by workers performing repetitive job functions. The simple truth is that the same work exposures that affect the upper body also can affect the neck. Work exposures such as awkward postures and repetitive movements have been linked to disorders of the neck, including chronic neck pain; disorders that are no less serious than those involving the hands, wrists or elbows. A publication of NIOSH (1997) reviewed more than 230 research studies of work-related disorders of the upper extremities. Among these studies, 89 of them included investigations of work factors relating to disorders in the neck and shoulders. The review committee for this publication concluded that there was "strong evidence that high levels of static contraction, prolonged static loads or extreme working postures . . . increased the risk for neck and shoulder musculoskeletal disorders." Although awareness in the information place is growing, it lags behind the need to holistically revolutionize the modern workplace. Because of the extraordinary rate of change in technology, health problems often set in before the potential usage dangers are realized. In effect, employers, healthcare providers, physical therapists and employees can be blind-sided when staffers are physically impaired on the job site. The prescription: set the right direction to reduce the risks to workers by doing tasks more effectively with the proper tools, and provide the appropriate training and education so workers can use new technologies safely. The incidence of work-related back pain and neck pain can be significantly reduced.